As many of you are aware, the Delta School District has recently invited all stakeholders to participate in an inclusive Visioning Process. As challenging as it is to create a shared vision for a school district, the goal is to generate a district vision by late spring time. The process of creating this shared vision will include contributions from each school community in the district and from some district events that bring stakeholders from across the district together. To read more details about the Delta School District's Visioning process, please read Terry Ainge's post Vision: Begin with the End in Mind . On Monday, February 7th over 120 members of the Delta Secondary School community participated in the first step of the school's contribution to the Visioning process. Teachers, educational assistants, support staff, students, parents and administrators all participated in this sharing process. Each of the 24 groups was composed of at least one student and three or four adults who play a variety of different roles in the school community. Table discussion started with each person sharing his or her most memorable moment of learning in the Delta School District. Moments of Greatness included people's experiences inside and outside the classroom, curricular and extra-curricular, short moments and moments that spanned years. Each group then extracted the common core values that were revealed by the stories. 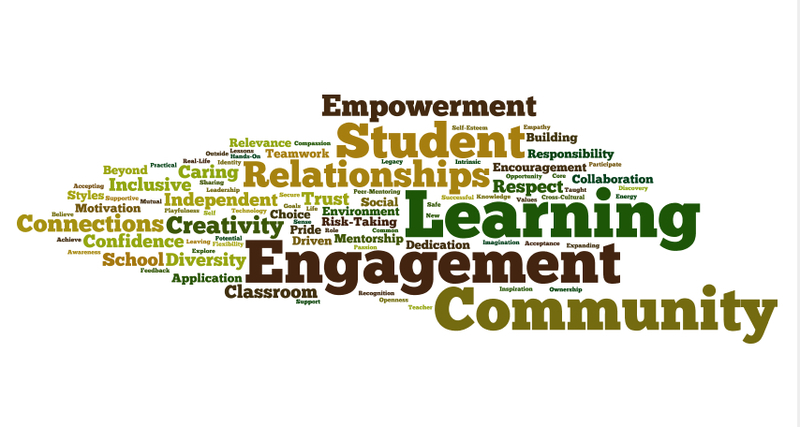 The following wordle was created from the core values that each of the 24 groups contributed. Most of the words on this list are commonly referenced words in educational circles. Many of you may then wonder why we bothered to engage in the exercise we did. Well, as important as it is for the school district to eventually come up with a vision, it it the process of doing so which is truly valuable. The process of working together with a variety of members of the school community was an excellent reminder to all of us that we all have the best interest of our students at heart. We have different responsibilities and play different roles in advancing the learning of our students and naturally, from time to time we have different ideas and opinions on how best to move forward. The value of this inclusive process is that it brings us closer together and gives US the chance to create OUR vision. It will not be someone else's vision, a vision we don't understand or one that has been thrust upon us. It will be a vision that each of us has contributed to...a vision we share with each other. I'm hopeful and optimistic that our vision will provide us a compass for future decision making and will serve as a bold reminder of where WE hope to go. To view pictures from the recent visioning exercise at DSS, please see Terry Ainge's video DSS Visioning Part One . What an outstanding process! We will be looking on actively to see how it goes--keep us posted! I like how you are actively modeling the tenet that shared expertise is the driver of all educational change. 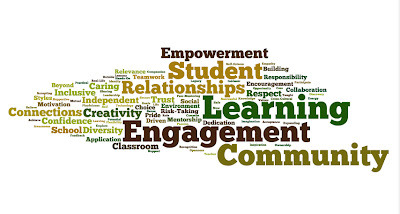 The effectiveness of your school's vision will be directly porportional to the quality of dialogue and debate - I look forward to seeing what your community creates. Thanks for your comments. The sharing of different perspectives from people who play different roles within the school community contributes to the much-needed cohesion in any effort to articulate a vision. Involving students in the process has been very powerful. Often, adults make decisions that impact students without fully involving them in the decision-making process. We all know that schools are for and about kids. Gaining their perspective about their learning provides valuable insight into what engages students and ways in which we can look to improve our schools in the future. Our school community will be participating in the next step of the process in March and I'll do my best to keep you updated. No Phones, No Cameras, No IPods...no problem?